With an absence of nearly 20 days(Mother didn't allow me to be on line for the exams),I am back here and glad to see everyone here! Just like my title,rose sisters,when Meer sacrificed her life to save Lacus,I was deeply moved .and from then on I have considered them as sisters,they are both pretty girls,like roses,and rose has a color that goes with their hair color well,so I added two roses(vectored from realistic ones)As the the blue bg,I don't know why,I just feel that blue matches all things on the wall well. ooh...now I can see the difference between Lacus and Meer.Thank u so much 4 clearing my head. Yeah, they're pretty as roses! I just love Lacus and roses too! I almost didn't download this because the damn thumbnail made the colors look so crappy. Upon viewing it fully it's clearly not that bad. 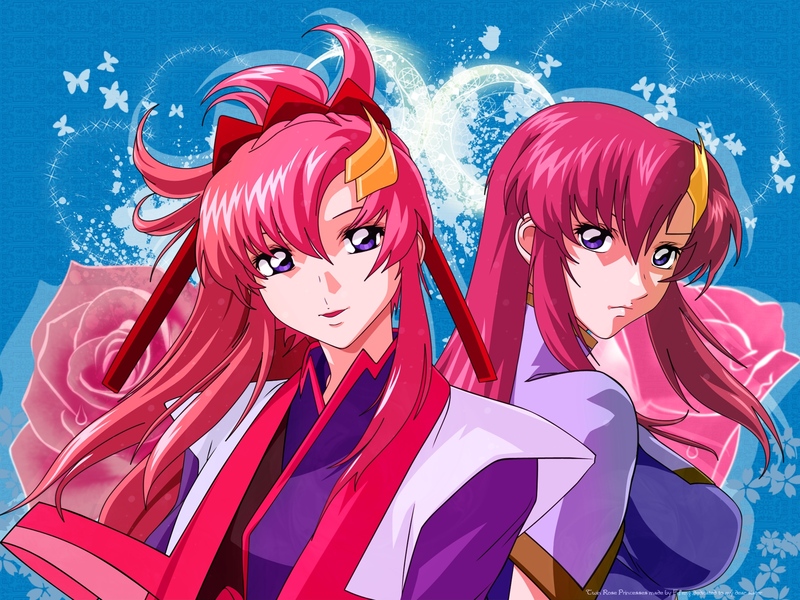 Still I think you should have laid off the red hue a bit (or perhaps kept the original colors) on Lacus and Meer because now they're a lot redder and darker than the roses in the background. On the plus side, your extraction of the scan was good and I like your background design and choice of fonts. So on the whole I like your wallpaper and thank you for sharing it. I may actually use it on my desktop after I tweak the colors a bit (for my own personal use, of course). So thanks again for the wall and take care! Looks like twins huh? I can see something like "light and shadow"